Left to right: Four Corners Cofounders George Esquivel, Greg Leftwich and Steve Porcari. They can now afford better signage. One of Dallas’ best and buzziest craft breweries announced last week it was being acquired by global alcohol conglomerate Constellation Brands. Located in the Cedars District of downtown Dallas, Four Corners Brewing Co. moved into its new beautiful 2-acre home in November 2017. A refurbished 18,000-sq-ft brewing facility hosts a 50-bbl brewhouse that is currently capable of 25,000 barrels of production with expansion capability to 75,000 bbls. Today, the company is distributing across the state of Texas. Its fantastic branding and packaging were inspired by the Mexican bingo-style game called Lotería (dig these logos). These designs were even awarded top honors from The Dallas Society of Visual Communications in 2015, winning gold for packaging design and gold for Judge’s Choice. The brewery was founded by three friends George Esquivel, Greg Leftwich and Steve Porcari in 2012 in west Dallas, and since 2014 Four Corners has grown five-fold, expanding capacity from 8,000 bbls in 2016 to 25,000 bbls in 2017. From those numbers, the brewery is still clearly in grow mode, so what was the motivation for selling? Financials were not disclosed, but Constellation is an enormous global alcohol maker that once paid $1 billion to acquire Ballast Point Brewing Co. With the slowing of the market and the size of Four Corners, let us assume the money was not of that caliber. With hundreds of alcohol brands, Constellation produces spirits, wine, beer and soon pot drinks. The company owns Ballast Point Brewing Co., has commercial rights to Crown Imports brands like Corona, Modelo and Pacífico in the United States (AB InBev owns them everywhere else) and recently purchased Oakland Park, Fla.-based Funky Buddha Brewery last August. Along with the craft category, Mexican-style imports is one of the biggest growth markets in America, and Constellation is positioning itself to offer a craft variant of that. “We are grateful for the beer folks who have elected to try our beer, stop by our taproom, share our brews with their friends and families, follow us on social media,” said Esquivel. “They have given us a chance to share a beer and a story with them, and that in itself is amazing. But if being an independent craft brewer is the only factor in that choice, well I suppose we’ll have to part ways. Grounded in Texas roots, Four Corners’ portfolio plays up the Hispanic-American styles, flavors and branding that complement Constellation’s marquee beer brands. Pushing popular nameplates like Local Buzz Honey-Rye Golden Ale and El Chingón IPA, Four Corners will join Constellation’s Craft & Specialty Beer Group. All three cofounders will continue to be stewards of the brand. The Four Corners’ team of employees will also work together, with its cofounders, to continue running the day-to-day operations. Production is staying put for now, and there’s no rush to jump into giant distribution plans. 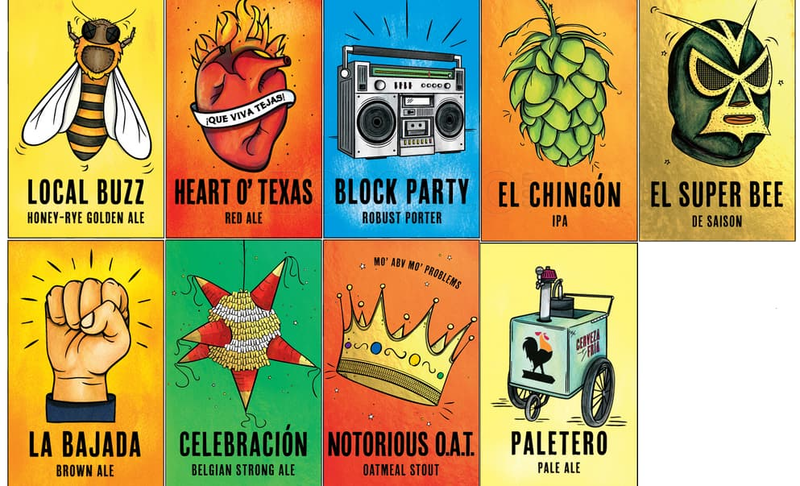 Grounded in Texas roots, Four Corners portfolios plays up the Hispanic-American styles, flavors and branding that complement Constellation’s marquee beer brands. While AB InBev is usually the No. 1 bad boy on the block with craft brewers and fans, Constellation doesn’t seem to garner the same Big Beer horns that other transnational beverage corps get. Of course, many beer fans will still see this sale as selling out. What say you about that, Mr. Esquivel?